All about the feeding game! 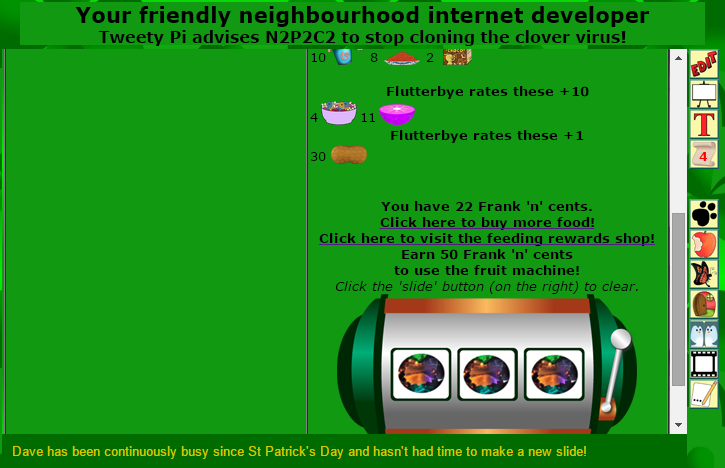 -- or take a tour of the fruit machine! Feed pets to win limited edition prizes! 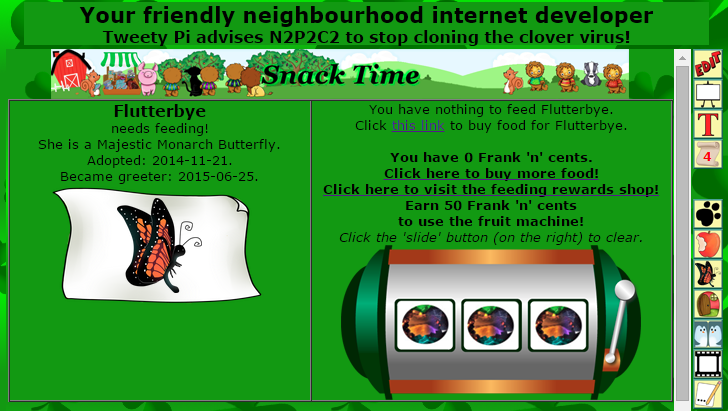 The PnF 'feeding game' is simple to play, with lots of fun features! Here's all about them. On the right of your slide is a 'bitten apple' icon. Click it to begin the feeding game! 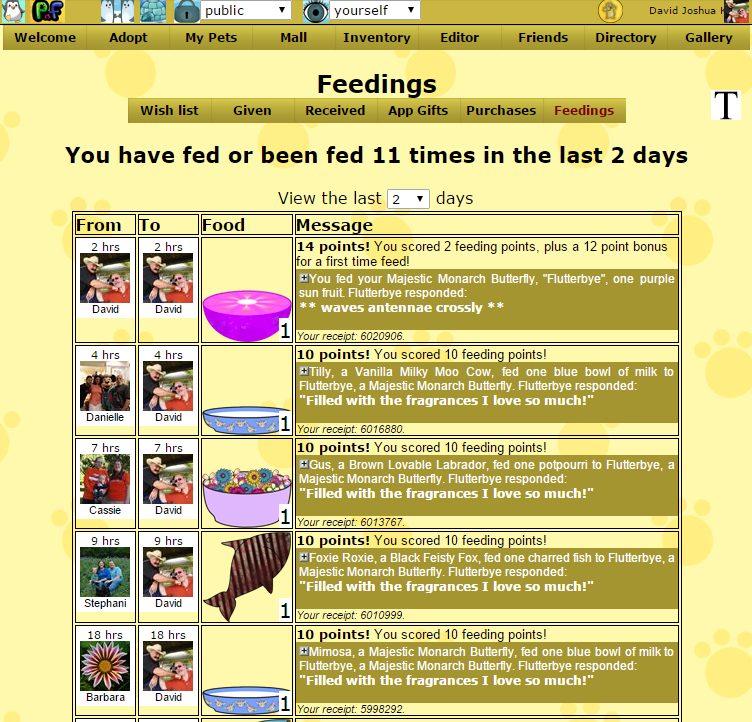 If you are the first person to try to feed your own pet, the page will look like this. You have nothing to feed your pet yet -- so let's go buy some food! Just click the link in the overlay. 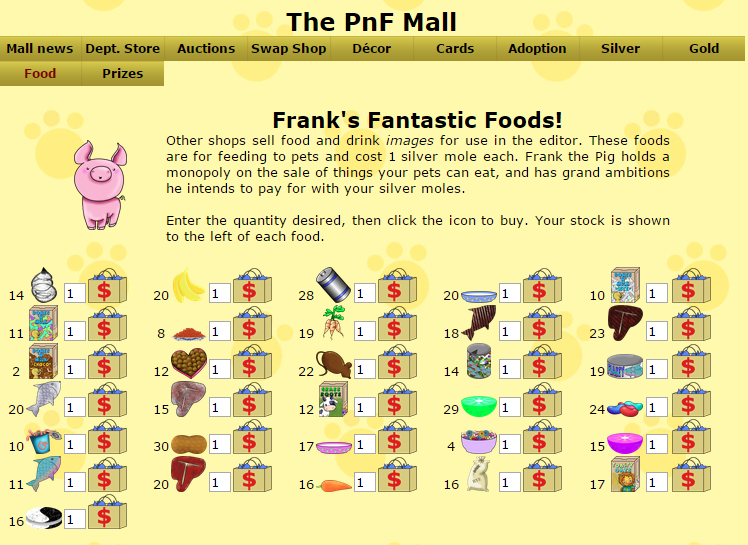 Frank the Pig sells foods you can feed your pet (and other user's pets) with here. (To get there, click 'Mall' in the main menu, then 'Food' in the Mall menu.) They are priced in 'silver moles'. (To get silver moles, 'shake paws' with other users, or buy silver moles for golden moles on the 'Currency' tab in the mall). Below, the number on the left of each food image is your stock figure. We suggest you try to keep at least one of each food in stock, as different pets have different favourites. Back to your pet's page. Click the 'bitten apple' icon again. Now that you have some food, you will be shown a report listing all the foods your pet has not yet tried at the top, then how much it likes the foods it has already tried. Hover a food to see what it is called. Again, your stock level is to the left of the food. Foods you have no stock of will not be shown as you can't feed them to the pet. 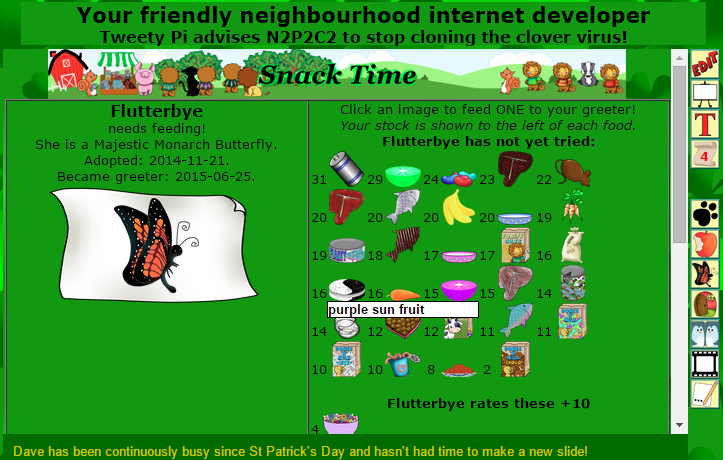 Let's click the 'purple sun fruit' to feed one to Flutterbye. On clicking you are told what the pet thought of the food and how highly they rated it. The pet's rating is also your score. But if you are the first to feed a pet a food, then you get a bonus of 12. In this case you have won +10 for feeding the pet a food it really liked, and +12 for being the first to try the food out with this pet. So trying out new foods always scores highest. You get +22. But +22 what? 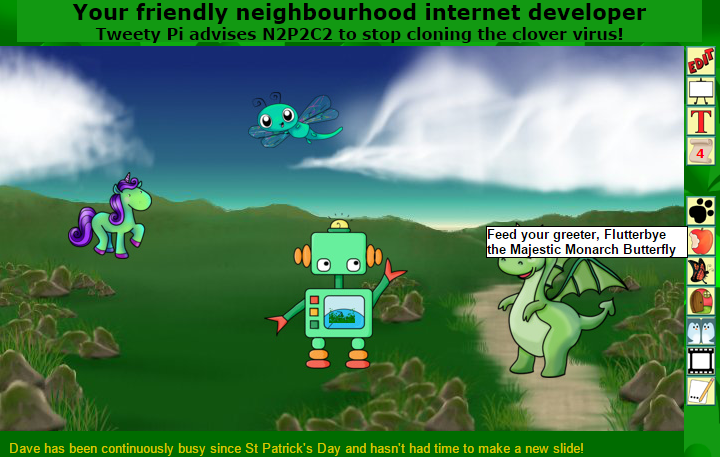 +22 Frank 'n' Cents -- Frank the Pig also issues the coinage! 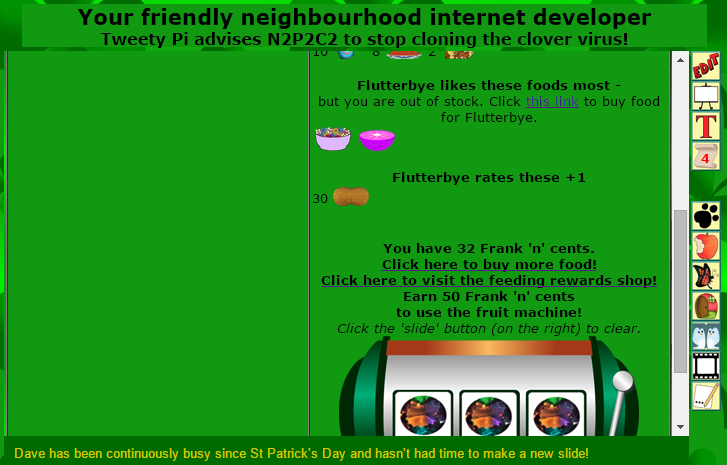 Just hover the tiny golden coin in the toolbar and you be shown how many Frank 'n' Cents you own, along with golden and silver moles. If you try to feed your pet more than once a game 'day', you will find it is 'out'. 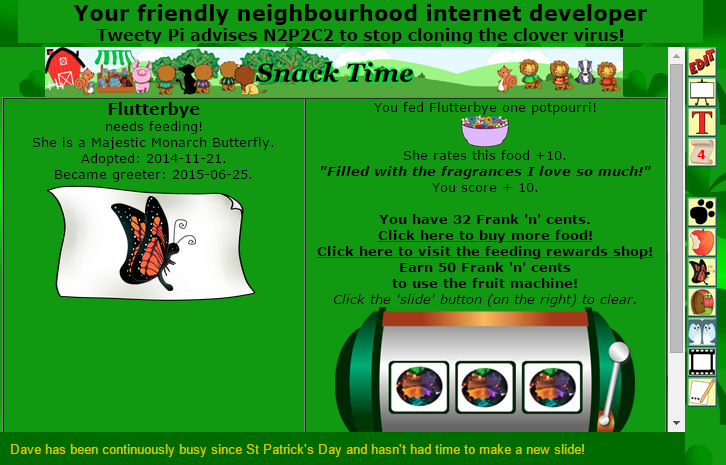 The PnF feeding game is a social game where you win points for feeding lots of pets once per day, rather than thousands to the same pet on the same day. (The game 'day' is the same as the gallery 'day' and ends at midnight GMT; usually about 8pm EST). 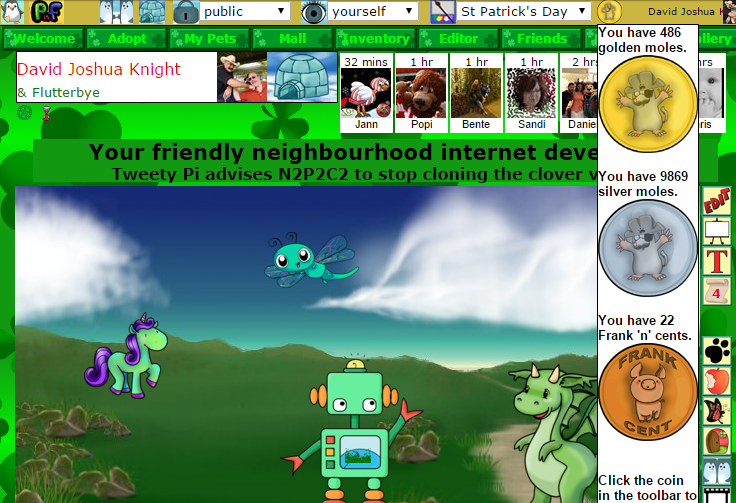 When you next feed a pet, take a look lower down the page. The pet's favourite foods are listed at the top in descending order, +10's at the top and +1's at the bottom. Every pet is assigned one +10 and one +1 when it is adopted, and these preferences are special to the pet type -- all butterflies love potpourri and hate peanuts. 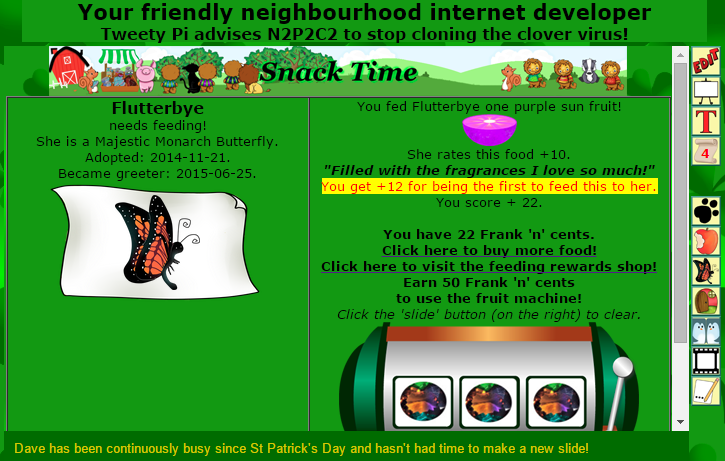 In this case the only food this butterfly has actually tried is the purple sun fruit. So let's feed this pet a potpourri. As the page indicated, you score +10. The message you get for any score is different for each pet type, and though you always get the same score feeding the same (individual) pet the same food, what it says about the food may sometimes differ. If you run out of food, the pet will tell you what it likes best and you can follow the link to the food shop to go and get some more. You can tell who has been feeding your pet by looking at the 'Feedings' list. Click the scroll icon on your 'My Pets' page to go to your wish list. Select the 'Feedings' tab, and there are all the details. 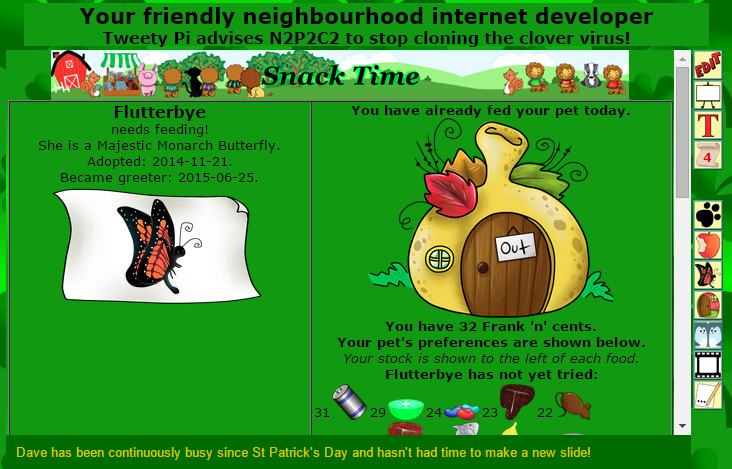 Just click a user's icon to go and feed their pet! (We may later move the position of the 'Feedings' list and alter the details, but there will always be a list). What shall we do with all those Frank 'n' Cents? Spend them in the fruit machine to win a huge range of prizes! Now let's go take a look at the fruit machine!